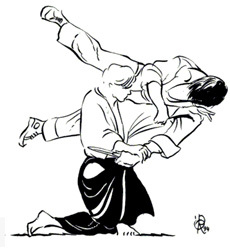 On Saturday November 27th Sligo will host a One Day Aikido Course in the Knocknarea Arena in IT Sligo. The course will be the last Aikikai Ireland course of a very eventful year and one not to be missed. At the course students that wish to grade will have the oppurtunity to do so. After the training there will be a Christmas party, yep it's that time of year already. So get your game faces on!!!! We will take numbers for the meal/party at the course!! 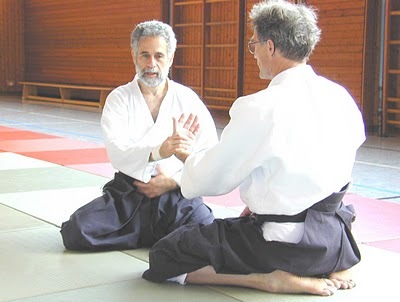 October 2010 Aikikai Ireland will have the pleasure of Michele Quaranta Sensei conducting a seminar. This is the 3rd time this year that Quaranta Sensei will give a course in Ireland. The course will be in St. James Hall, Athboy, Co.Meath. **Update: Unfortunatley Michele Quaranta Sensei is temporarily out of action with an injured back and cannot attend the course. Michele Sensei sends his sincere apologies and regrets not being able to make the course as he had been really looking forward to coming to Ireland once again. However all is not lost, Michele has asked Joe McHugh Sensei 3rd Dan to give the course in his absence. Joe is an instructor at the Aikido Ikeda Dojo Zürich and also a long term student of both Ikeda Sensei and Michele Sensei . You will be familiar with Joe (pictured left) as he has traveled with Michele on all of his previous visits to Ireland. 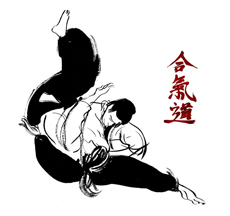 We look forward to the weekends training with Joe Sensei. Fiordineve Cozzi Sensei 5th Dan Aikikai will return once again to conduct another of his very enjoyable courses on the 11th to the 13th June 2010. The venue for this course will be the Sligo Dojo in St.Johns National School Gymnasium. The course will give students the opportunity to train with Fiordineve Sensei for the second time this year. 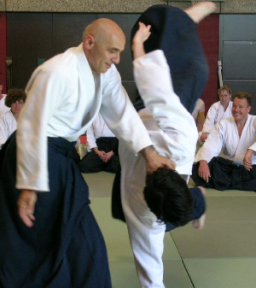 Students are once again guaranteed a good time with Fiordineve Sensei bringing his enthusiastic approach to Aikido. All of the Aikikai Ireland students are ready to give Fiordineve Sensei a warm welcome. Venue: St Johns National School, Gymnasium, Temple Street, Sligo. On Saturday the 29th of May, Sligo will host a one day seminar. The course will also offer students the ability to grade with gradings session to be held afterwards. About Paul Linden Sensei: Paul received his B.A. in Philosophy from Reed College and his Ph.D. in Physical Education from the Ohio State University. He is an instructor of the Feldenkrais Method® of body awareness education. He began Aikido practice in 1969, and he currently holds a sixth degree black belt in Aikido as well a first degree black belt in Karate. He is the developer of Being In Movement® mindbody training, the inventor of SpineLine® Bicycle Handlebars ™, and the author of a number of books about applications of body awareness training in various areas of life. For fun, Paul swims and rides his bike, runs, practices Aikido, reads, practices organic gardening, and writes. (After the Aikido sessions, Paul will provide "Being in Movement(R)" body awareness training for anyone interested, for an extra charge. He will also teach in the U.K., the following weekend). €30 for one session, €50 for both. €50 for first session only, €80 for both. 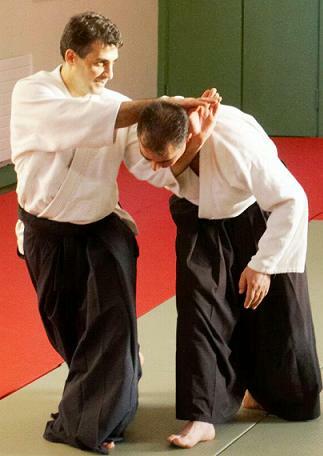 The Aikikai Ireland Spring Course will commence on the 9th to the 11th of April 2010, in St Johns National School, Gymnasium, Temple Street, Sligo.The course will be given by Michele Quaranta Sensei 6th Dan Aikikai. The course is a great opportunity once again to train with Michele Quaranta Sensei and a large number of his students that are travelling from the continent. This is the second time this year that Michele has visited Ireland. At this course there also will be Dan and Kyu gradings conducted. 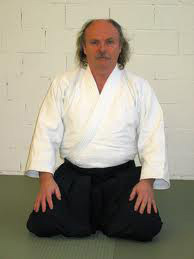 Athboy Aikido School will host Fiordineve Cozzi Sensei 5th Dan Aikikai on the 12th, 13th and 14th of March 2010. 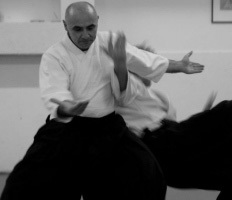 The course promises to be as enjoyable as ever with Fiordineve Sensei. The venue for the course is in the St James Hall, Main Street, Athboy,Co.Meath. The Aikikai Ireland Winter Course will commence from Fri the 29th to Sun 31st January 2010, in the St James Hall, Main Street, Athboy,Co.Meath.The course will be given by Michele Quaranta Sensei 6th Dan Aikikai.The course is a great opportunity once again to train with Michele Quaranta Sensei and his travelling students. Not forgetting the always warm and welcoming hospitality of the Atbhoy Aikido School lads.